You have heard and read many times about how various fruits, vegetables, drinks, and exercise are good steps for prevention of cancer. I would like to pass this bit of information about coffee. For those of you who drink 4-6 cups a day and have been told to cut down the coffee, REJOICE!!! You are on the right track for cancer prevention. A new study of 60,000 women shows that those who drink 4 or more cups of coffee a day cut the risk for endometrial cancer by 25 percent. Not bad for the morning brew, ah! Men benefit too, a recent research suggests a 60% drop in the risk of developing aggressive prostate cancer among those who drink 6 or more cups of coffee daily, compared with men who don't drink coffee. enjoy your day and your coffee! The new year has rolled around again and it is time to try something new. Brew your coffee with a French press instead of your old way. If you have not tried this method of making coffee, you are in for something fantastic in taste, easy to clean and not expensive. For single or two person households, this is a perfect match for a cup of coffee in the morning without a lot of fuss and time. It is a fast, convenient way of making a good cup of coffee. You can buy French Press coffee makers for 1 to 8 cups, multiple colors or plain glass and thermal. This is great way to entertain your guests when you have a small group and wish to serve fresh coffee fast. 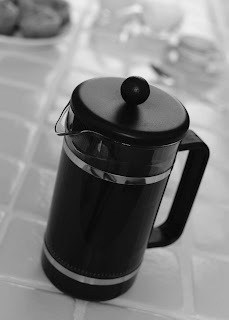 French Press coffee makers has been around for years and are becoming more common. We, Americans are big drip coffee drinkers for a long time but I feel this year is the year that not only the use of the French Press for coffee making will be greatly increase in the household but coffee shops will embrace this as a single table server for their customers. What a better way to serve hot, fresh coffee! Here are some tips on making a good cup of coffee using the French Press. 1. Grind your coffee to a medium/fine texture(sand texture). Remember the finer the grind the less amount of coffee to use. Experiment to find your level of grind texture. There is no such thing of a perfect grind. People's taste are different and so are their coffee grind! 2. Scoop 1.5 to 2 teaspoons of coffee per cup into the French Press. 3. Heat your water to boiling and fill the French Press to the full cup level mark. Less water in the French Press produces stronger coffee. 4. Put the French Press plunger on the top of the grounds and let it brew for 4 minutes. When 4 minutes have arrived, gently and slowly press the plunger down to the bottom of the press and let it sit there for a few seconds. You will noticed that the coffee is settling down. 5. Reward yourself with a good cup of fresh coffee. Refrigerate any leftover coffee for later. I enjoy a bold roast of Brazil Santos or medium roast of India Monsoon Malabar. Remember to choose your coffee and experiment to find your perfect cup.